Every good story has a final chapter, a final disclosure or final word. (Sure sounds like we're over-using the word 'final' to me.) 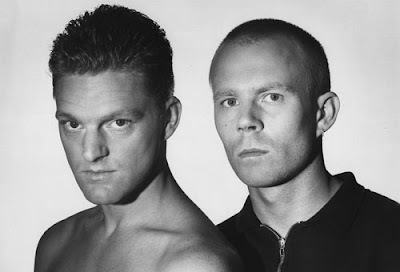 Erasure help us shut the book on Talking 80s Music with Martin Hennessy after 208 episodes and 4+ years. There is a reason. Not only are the duo a major influence on Martin's musical eclecticism but they fulfill the request of our long-time listener Linda. (We also threw in an Aerosmith retrospective mix for Ben -- who was AWOL.) You'll hear a retrospective mix, live version of "Leave Me To Bleed," "Don't Suppose" and "How Many Times?" as well as a few calls from listeners. It's a bit trite to say 'how hard it is to say goodbye.' (I mean, there are tons of songs about it.) But when you attack anything with passion for a prolonged period of time, it's unbelievably difficult to set it aside. It helped to have so many listeners there for the last show and to hear from them. We can only hope that as this series remains available for more and more new listeners that they develop the same passion and determination to see what else is out there. The 1980s were more than the few hit songs that still get played ad-nauseum on some radio stations. We hope that this starts your personal journey into finding your own gems. Although there were technical issues, we wouldn't want to go out any other way. Martin does have a personal video project in the works during a little down-time, a new project in development and you can find out more of what he's up to at http://www.MartinHennessy.com or look for him on Facebook. It's going to take some adjusting but he has said that something new could happen by this summer.